Today, November 14th, is celebrated as Children’s Day in India. It is a day dedicated to the celebration of innocence, happiness, love and laughter that are all beautifully embodied by children all over the world. Children in my daughter’s school made bookmarks to be handed over to friends and were studying all about Pandit Jawaharlal Nehru, whose birthday it is, today. As we live in our cozy homes which shelter us from rain and heat, with clothes on our back and food on the table, little do we realise how much suffering surrounds us on a daily basis. Even as I waved goodbye to her as she left for school this morning, my mind was thinking about those countless children who do not have a home, books to read or even food to eat. When Blog Adda and Akshayapatra came up with this noble intiative, I could not help but sit down and blog about it, right away. Hunger remains the No.1 cause of death in the world. 1/3 rd of the world’s hungry people live in India. 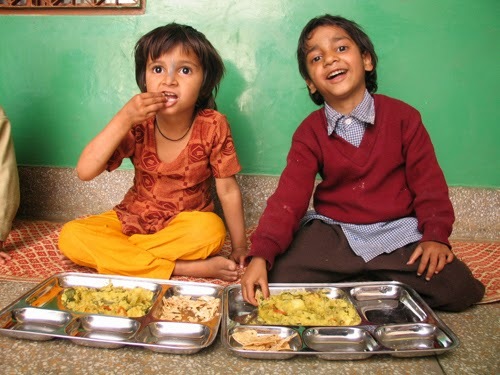 Between 2006 and 2007, malnutrition caused seven million Indian children to die, almost half of them before the age of one. Here I am, at home, trying my best to make the tastiest of foods so that my daughter can eat it without complaint and there are kids literally dying, due to lack of food. When did we become such a privileged lot? When did we stop valuing the things we have around us and start taking it for granted? Growing up, I recall how we would eat anything put before us, relish the food that we had and send up a prayer of gratitude that we had something to keep hunger at bay. I am not saying that my child does not value food. But, she and countless other kids, are simply not aware of the reality that is hunger and starvation that millions of children face daily. Akshayapatra came up with the very commendable Mid-Day Meal Scheme. Under this, they pledged to end classroom hunger across India, by feeding children from Government schools and Education Centres all over the nation. But, as we all know, these things can always be helped along by contributors, both monetarily and in terms of ideas. Ask your school (the school your child attends) to organise collection of food grains/ items which can be sent to Akshayapatra Foundation on a monthly basis. Rice/ Pulses/ Vegetables/ Fruits- once a month. The sheer volume of food items that can be made from the contributions of over 2500 children each month can go a long way towards ending classroom hunger. As we celebrate children today, let us also empower them to think beyond the limited scope of our homes and our families. All the world is ours and we must do our best to give back to it. Never forget that a group of thoughtful, committed citizens can change the world. For more information on Akshayapatra’s initiatives or how you can be a part of it, check here. Whether you want to donate your time/money is of course, your choice. But, if you are a blogger, you can surely do this, sitting in the comfort of your home. Write a blog post, as I have done. Blog Adda will feed a child for a year. How lovely, Shailaja, that you chose to blog for this noble initiative. I hope we bloggers can do our bit. Like you, it breaks my heart to see tiny kids suffer from hunger. I liked your suggestions. Let me recommend them to the Principal at my children's school at the next PTI. Every single donation and effort counts. It is a very heartfelt gesture. I really like the idea of contribution from home. Hope we have a very successful campaign. You have all my respect for blogging for this initiative. Really, while we try and provide the best for our own kids, those unfortunate ones really need our compassion and generosity.Thanks for the reminder. I'm going to do my bit for sure. Wish all the children around us and within us a happy children's day! Agree with your points, Shailaja. My daughter's school does invite for non-food items & packaged food items that are distributed to the less-privileged. Lovely initiative Shailaja and trust you to be so prompt about it :). Very apt for Children's Day as well. It is a great initiative. Hunger is no.1 cause of death even today! A little from us could do a lot of help to a child. yea Akshayapatra is a great initiative.. and if we all took one step towards helping out, we could collectively eradicate childhood hunger. When we were in Mysore, I used to go regularly to ISKON temple, and have contributed some amount to there Akshaypatra. This teeny-tiny donation I made, that day – made me extrememly happy! I am glad you reminded me of the privileges that have added up, now it is time to give to a foundation that I believe in and where I have seen good work done! Excellent idea! May I suggest that, instead of donating in kind, each child can donate the cash equivalent of any food item once a month. The schools could put up a list like Rs. 50 for a kilo of rice, etc.. This would be easier for the schools and for Akshaya Patra to handle. Doing it this way would also help to make kids aware of the prices of food items. Greek Yoghurt is a healthy snack option you can give your kids. At a blogger meet, Danone shared information and recipes on this tasty item.